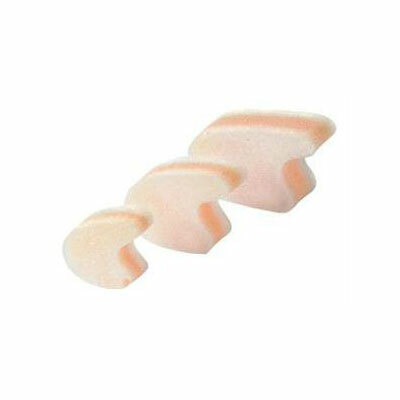 PediFix 3-Layer Toe Separators Medium 12/pk is a specialty foot care product by the makers of Pedifix. Pedifix has been a trusted name in foot health products for more than 100 years. 3-Layer Toe Separators are designed to separate crooked and overlapping toes as well as toes that rub together to relieve corns, blisters, pinching and cramping. The soft cushions soothe and prevent irritations by absorbing pressure with the durable, three-layer foam design. Provides relief for sore toes. Relieves corns and other toe irritations. Cushions and aligns crooked toes. Contains 12 3-Layer Toe Separator - Medium. Directions: Place separator between toes. Pull on hosiery carefully and re-adjust as necessary. Trim with scissors for custom fit. For maximum benefit do not wear shoes that interfere with toe freedom. Washing Instructions: Hand wash in warm, soapy water. Rinse thoroughly. Press flat in towel to remove excess moisture. Air dry completely before reuse. Warning:If you have diabetes, consult your doctor before using. Non-sterile. Do not use over broken or inflamed skin. If systems persist, visit a foot specialist.